Possibly the prettiest house in the street, this picture perfect home is today's gorgeous feature dwelling that we are lucky enough to be touring. Throughout Japan, space is extremely limited and often comes at a premium. Although this might be seen as a disadvantage to families and architects alike, it often encourages creative thinking, and a desire to maximise the efficiency and enjoyment of one's very own patch of earth. 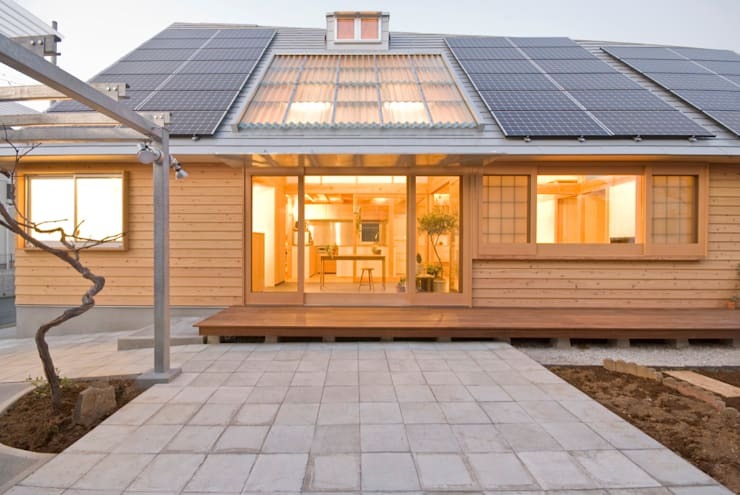 However, designing and constructing a compact home can often present a host of challenges. 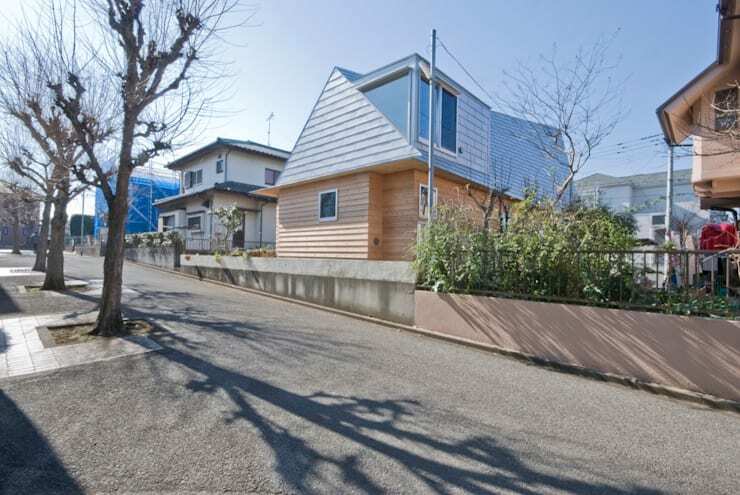 Thankfully the owners of this adorable abode employed the help of talented firm Ai and Yuki Architectural design. 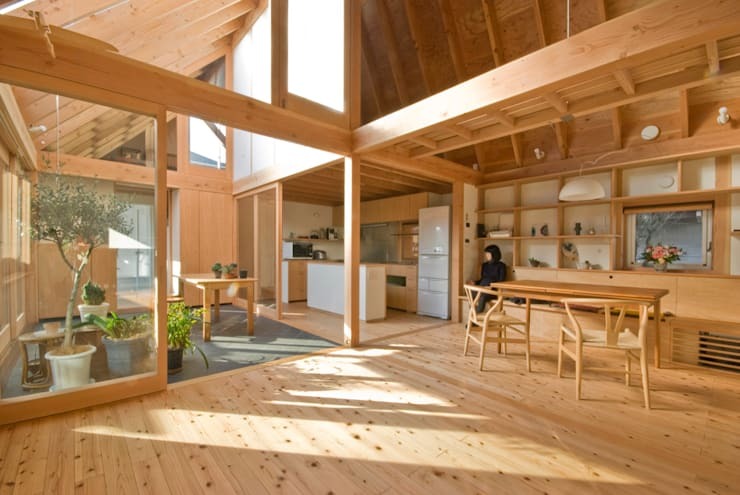 Affectionately referred to as the Skew Hut, this lopsided, timber-clad dwelling is an exemplar of all that can be achieved through thoughtfulness and persistence. The family residence boasts a rich variety of plant life within the garden, as well as an extensive entertaining space should they wish to host a stylish event or shindig. 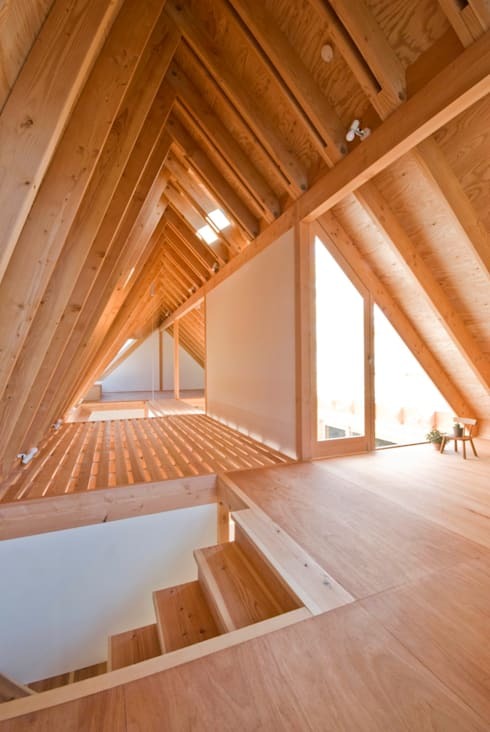 Replete with timber interior spaces, surprisingly spacious rooms, and many other gorgeous architectural accents this is one home you aren't likely to forget! As we take our first glance at the house within its street setting, we see how the pastel timber hues work extremely well against the light coloured roof space. The tree lined street sets the scene for a wonderful experience that evokes both tranquillity and serenity. From this angle we can see the skewed nature of the home. The construction of the dwelling allows the top floor of the house to blend in well with the sky, while the ground level's timber cladding evokes a sense of earth. The result is a landscape-esque image that looks vibrant yet subtle, and effortlessly welcoming. Moving around the side of the home we see the abundant windows and sliding glazed door that provides the home with a huge volume of natural light. The garden plants add a sense of life and vivacity to the home, working wonderfully alongside the timber cladding. Further within the dwelling, the exterior decking provides the home's occupants an ideal space to entertain or simply enjoy the tranquil surrounds. Glazed windows again provide light to the interior of the home, and appear effortlessly chic. 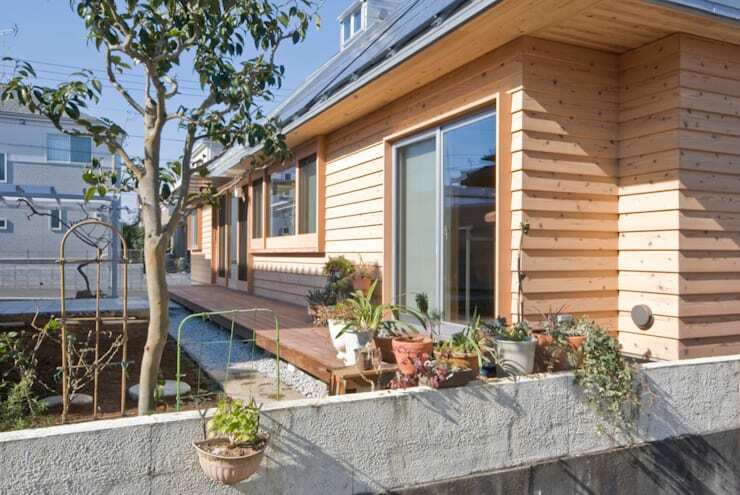 Additionally, the dark timber flows extremely well against the lighting timber cladding and house frame. Low maintenance living was employed throughout the home, but particularly within the garden space that maximises efficient flooring. 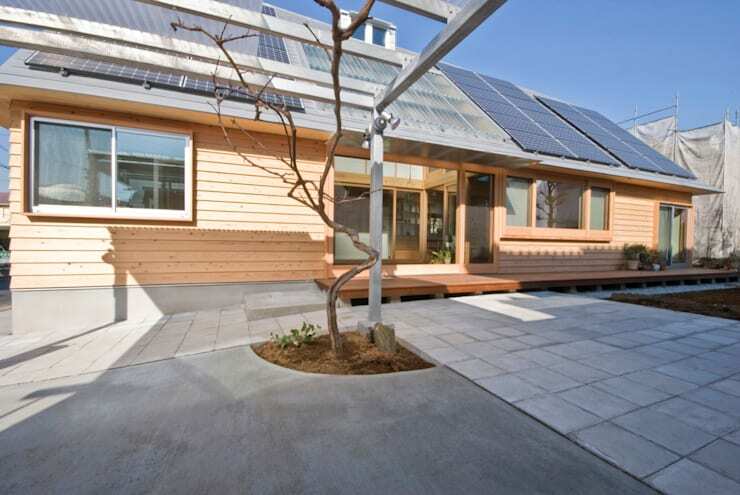 Sustainable materials were incorporated to increase the home's energy and environmental friendliness. From this angle we are also able to witness the solar panels that have been installed to the angled roof to provide energy to the dwelling. Set on a plot of 134 square metres, it is already surprisingly how well the architects have created a residence that feels much larger. Offering a warm welcome to all who approach the property, this image truly sums up what we love about this ingenious home. 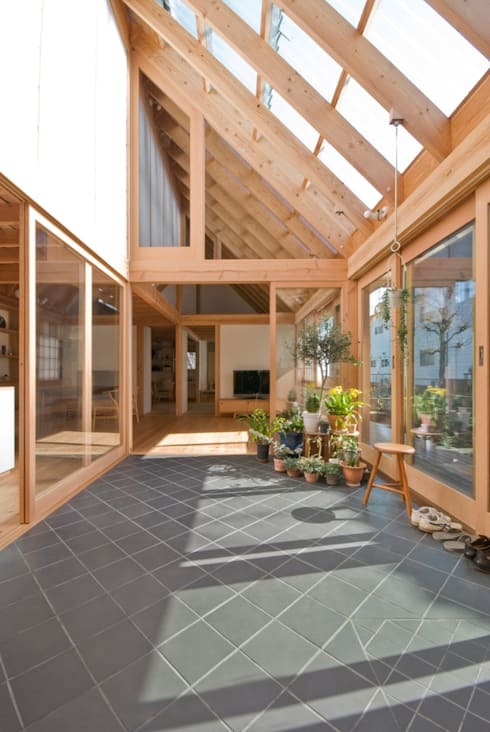 Once again the solar panels are visibly affixed to the room, and surround a roof light that adds natural illuminated to the interior. To the right of the image we see the shoji window panel, which is essentially a timber panel stretched with Japanese rice paper. This fusion of traditional elements against the contemporary architectural features is a smart and unique juxtaposition. Inside the property is truly astounding! Replete with a host of timber features, furniture and elements, the dwelling is absolutely striking and stunning. Open plan, with a double height interior space, this room boasts all the necessary modern amenities. 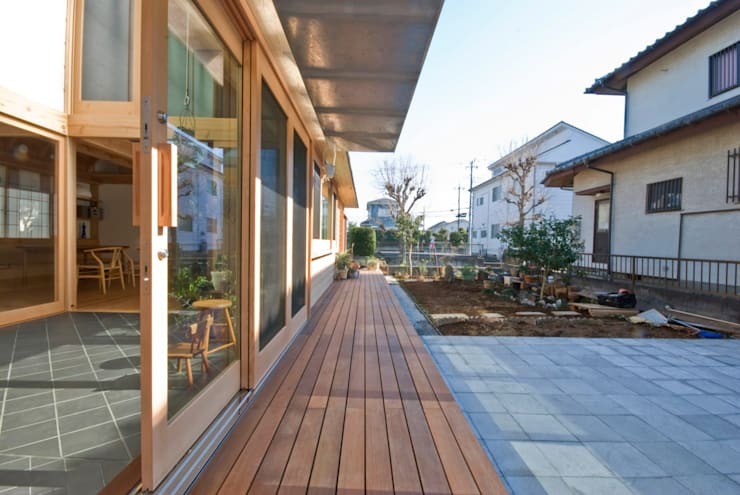 To the left of the image we also see the interior courtyard that provides a space for plants and foliage, contributing to the overall sense of a Zen-like calm. Moving into the indoor courtyard space we see the atrium style ceiling that employs roof lights to add an immense volume of sunlight. Ideal for inside entertaining, this space could be utilised in a variety of ways, adding to the home's versatility. Minimal yet extremely charming, this charismatic room is a beautiful example of the delicate indoor design employed throughout this property. The wall mounted shelving provides efficient storage, and further contributes to the cosy aesthetic. A single cube shaped window offers the individual studying or working within this room an inspiring moving artwork, contributing to the sense of life and energy within the home. Next up, the bathroom offers a clean and crisp ambience while still working in conjunction with the timber tones and gorgeous wood textures. The colour scheme is a combination of white and pastel hues, providing the occupant a sense of hospitality and warmth. Fittings and fixtures are timeless and minimal, effectively enhancing this room's age-defiance. Interesting, intriguing, and seamlessly integrated to the other interior spaces, this area of the house employs a time-honoured décor and aesthetic. Last up, we enter the loft space. 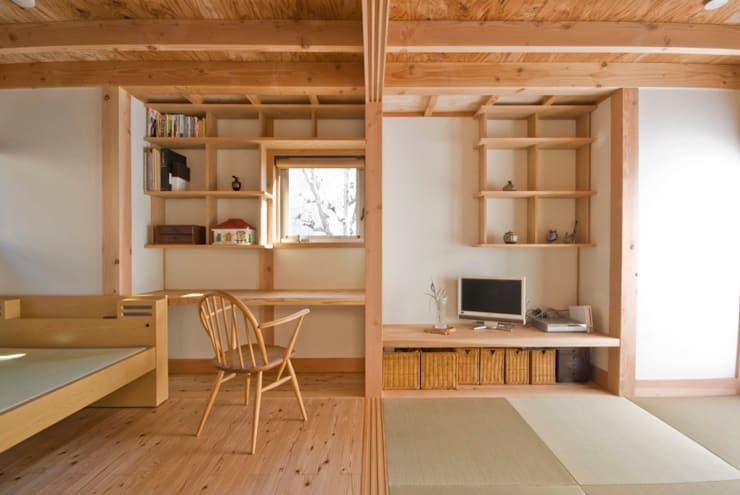 Surprisingly this home has even more room within its four walls, and manages to create an interesting and warm area for storage and additional living. Perfect for a play area for teenagers, or a guest bedroom, this is the icing atop a truly wonderful, and brilliantly designed home. 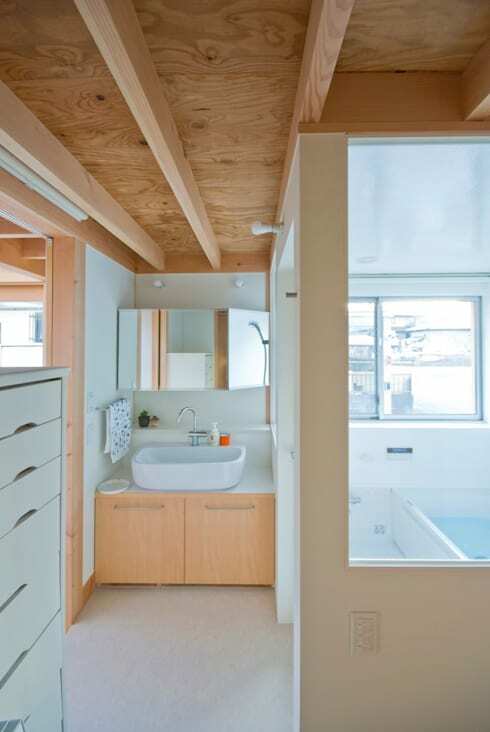 What did you think of this compact Japanese home? Let us know in the comments below!